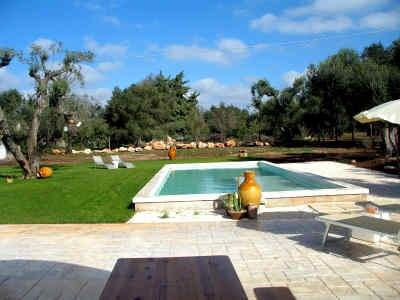 This villa with private pool is located near the small town of San Michele Salentino, in the heart of the Itria Valley in the Puglia region, is surrounded by greenery and numerous olive trees. In the spacious and fully fenced outdoor aerea you find an outdoor kitchen with barbecue, a nice swimming pool with sun terrace to relax and garden. From the furnished front porch you get into the spacious open kitchen, which is decorated in summery colors and offers a cozy living area, a dining area and fitted kitchen. At the kitchen adjoins the rear part of the house, in which the three bedrooms and the bathroom are. The bedrooms are divided in one double bedroom and two twin bedrooms. La Pergola is comfortably equipped with satellite TV, Internet, air conditioning, washing machine and fireplace. So you should not be missing anything in your holidays in Puglia. You can take a dip in the pool, relax on the hammock under the olive tree, and enjoy a wine and local delicacies in the evening on the terrace. Especially for children there is plenty of space in the grounds to play. And the beautiful swimming pool is available for you alone from April to late October. Excursions you can take to Cisternino, Ceglie Messapica, Martina Franca and Ostuni. Very interesting are the caves of Castellana, the trulli town “Alberoello” or the nature reserve of Torre Guaceto. The Zoo Safari in Fasano is nice for younger guests with a safari leisure park. The 800 kilometers of coastline can you arrive in 20 minutes with your car..
Price incl. water, gas for cooking, linen, towels, electricity, final cleaning. Payable on the spot: Deposit € 250.00 heating / air conditioning / wood for consumption.